Public investments need to deliver extra financing from the private sector and environmental and social benefits from the project. Public actions, as summarized above in the form of technical assistance and capacity building, need to create an attractive investment environment. 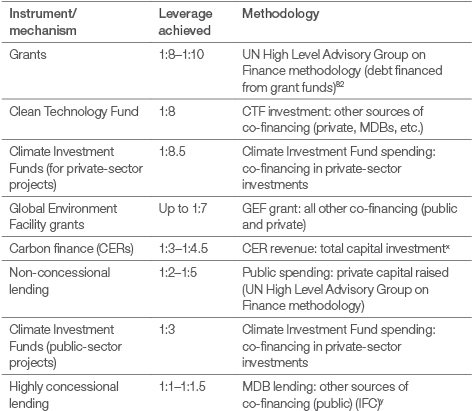 The effectiveness of such public actions in mobilizing additional finance cannot be easily measured but when it comes to determining the efficacy of alternative tools and mechanisms, assessing private finance mobilized can shed some light on where resources could be best allocated based on past performance (Table 4 ). Note: The methodologies used to calculate leverage of the different instruments shown differ, and therefore individual ratios should not be compared with one another. The OECD assessed 50 green investment projects and concluded that depending on the methodology deployed, leverage factors ranged from 1:0 (no leverage) to 1:78 (extremely high).81 Leverage factors varied widely depending on the technology, mechanism used and region of investment. Public funds often do not leverage private investments but come as a windfall profit, crowding out private funds, and high leverage does not necessarily equate to a large impact (such as emissions reduction or positive social gains). A stricter and more functional common definition and methodology for leverage of private investment is needed to measure the effectiveness of public interventions, and should take into account the benefits of private investment beyond the provision of capital (mitigation or adaptation benefits, for example). More work is needed to understand the social and environmental benefits of deploying public finance, such as generating jobs or reducing greenhouse gas beyond mobilized private investment. High levels of finance mobilization do not necessarily mean high levels of environmental or social benefit. At the end of 2011, US$ 28 billion worth of pre-2013 CERs had been contracted forward. If all underlying projects are implemented, these contracts will have supported additional investments of more than US$ 130 billion in developing countries.87 Research from Climate Strategies88 suggests that the CDM mobilization ratio is in the range of 1:3–1:4.5 after adjusting the leverage definition to include only mobilized funds that were not already earmarked for climate finance. Project-based markets have suffered as a result of the economic recession and the uncertainty around the future of the Kyoto Protocol. The total market value of CDM finance as an incentive has more than halved since its peak in 2007.89 Governments need to keep the momentum high by pushing for new binding reduction targets to drive continued climate-change mitigation investment in emerging economies. 82 Report of the Secretary-General’s High-level Advisory Group on Climate Change Financing, 2010, UNSG AGF; http://www.un.org/wcm/content/site/climatechange/pages/financeadvisorygroup/pid/13300. x Leverage ratios achieved under alternative methodologies have been shown to be higher but this figures is an adjusted average to include only mobilized funds that were not already earmarked for climate finance (Source: Is there a leverage paradox within climate finance? 2011. Cambridge, United Kingdom: Climate Strategies). y This is for International Development Association-type (public) loans, since highly concessional loans are rarely available to the private sector. 83 Improving the Effectiveness of Climate Finance: A Survey of Leveraging Methodologies, 2011, Climate Policy Initiative; http://climatepolicyinitiative.org/publication/improving-the-effectiveness-of-climate-finance-key-lessons/. 84 Climate Finance: Engaging the Private Sector, 2011, IFC; http://www1.ifc.org/wps/wcm/connect/topics_ext_content/ifc_external_corporate_site/cb_home/publications/publication_climatefinance. 85 Climate Investment Funds Website; https://climateinvestmentfunds.org/cif/. 81 Climate Finance: Annotated Questions Document, Draft, 2012, OECD. 86 CDM Pipeline, 2012, UNEP Risoe, http://www.cdmpipeline.org. 87 State and Trends of the Carbon Market 2012, The World Bank; http://siteresources.worldbank.org/INTCARBONFINANCE/Resources/State_and_Trends_2012_Web_Optimized_19035_Cvr&Txt_LR.pdf. 88 Is there a leverage paradox within climate finance? 2011, Climate Strategies; http://www.climatestrategies.org/component/reports/category/71/324.html. 89 CDM Pipeline, 2012, UNEP Risoe, http://www.cdmpipeline.org.